It seems almost fitting that the rising country star responsible for co-writing Tim McGraw's monster radio hit "Truck Yeah" would have his first country chart Number One with the infectious "Buy Me A Boat." Trucks and boats just naturally go together. First, Chris Janson's cool, laid-back country vibe allows the song to have a comfortable groove that immediately puts the listener at ease. This is no easy feat, and Janson has obviously put in thousands of performance hours to achieve this. Likewise, Chris Janson has a natural charisma that oozes authenticity. The theme of the song is textbook country: 'I ain't rich but I damn sure want to be," sings Janson at the start of the track. Next, he begins to wish for a rich uncle and name drops billionaire Warren Buffett (who has country bona fides himself as one of the owners of Dairy Queen). Then, he says that people call him "redneck," "white trash" and "blue collar." With a few mentions of beer, Powerball lotto and a new truck to pull the new boat, this song will likely be the country chart hit of the summer - as well it should be. The musicians on the cut perfectly compliment Janson's superb vocal performance, and the song would be a welcome addition to every party, country bar dance hall, road trip or chilled night on the ranch. "Buy Me A Boat" is actually a song about classic American aspiration and hope. Average country men and women don't usually dream of large mansions and huge jewels to show off at wine and cheese parties. They are more likely to want a healthy and happy family - along with a nice boat with a new truck to pull it. 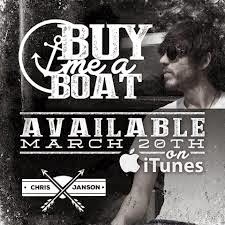 Click above to download "Buy Me A Boat" for 99 cents on iTunes.